In Naval Special Warfare and Naval Special Operations there are classes of divers that have specific jobs. As Navy SEALs, the missions require diving, underwater explosives, and travelling long distances submerged as a swimmer on SCUBA or within a mini-submarine. Rarely do the SEALs dive deep in the ocean vertically, but they will travel for miles horizontally at about 15-20 feet underwater. However, in the Explosives Ordnance Disposal side of the Navy, the men and women who dive to disarm explosives (mines, missiles, torpedoes, etc) will dive in special SCUBA gear that is non-metallic to avoid setting off explosives underwater at either deep or shallow depths. 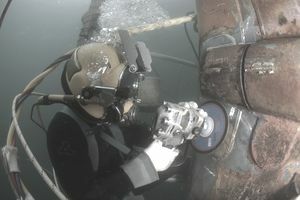 The Navy Diving community are salvage divers using hardhat-surface-supplied air as well as open circuit and will dive deep depths to fix equipment, build structures, weld ships (SeaBee Divers), find lost equipment such as planes, or even locate nuclear weapons. Assignment of NECs 5323 and 5326 are contingent upon successful completion of BUD/S training and six months of SEAL Qualification Training (SQT). For SDV personnel, they will also have to finish SQT, then add another six-month requirement upon reporting to SDV school or to an SDV team, whichever is earlier. SEAL and SDV mission information is contained in the appropriate Naval Special Warfare publications or may be made available on a need to know basis from CNO (N761). These missions are typically sensitive material and only military or government personnel with the appropriate clearances will be able to be involved with them. See NAVMILPERSMAN 1220-100 for details on screening and qualifications. The following NECs are job skills that many SEALs (SO) and Special Warfare Combatant Crewmen (SWCC - SB) are offered throughout their career. Many of these are also non-diving related as these warriors work on land, air, and sea. The following NECs are the EOD Diving Community's skill sets which all include diving. The underwater explosives piece done by Naval Explosive Ordnance Disposal is what separates the Navy EOD professionals from other military branch explosives experts. To join any of the Navy Diving Skilled Communities within the Navy, see a recruiter and ask to be a part of any of these specific jobs: Navy SEAL, Navy EOD, Navy SWCC, or Navy Diver. Though the SWCC community does not require diving, they are placed in the same group during the delayed entry program (DEP) while going through the enlisted process. They will also have the same fitness test as Navy SEAL, EOD, and Diver and attend Navy Special Warfare Prep Course after attending and graduating from Great Lakes Boot Camp. After the Prep Course, the four groups will go their separate ways and attend the related school for their NEC. Both Navy Diver and EOD will go through the same dive school but will change course as they advance toward their job descriptions of either salvage diver or underwater explosives expert.